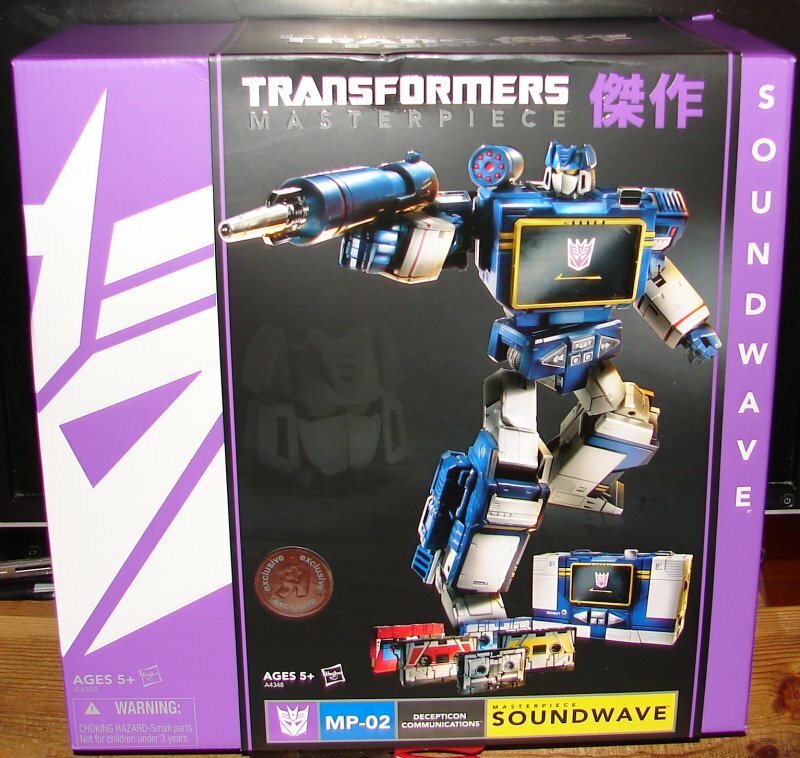 After nearly two weeks of going to Toys R Us every day, I finally managed to snag a Masterpiece Soundwave. I am not going to do a complete review of him as I already did an extensive review of the Japanese version of Soundwave & Laserbeak, Ravage & Rumble, and Buzzsaw & Frenzy. Read those reviews for all the details of these amazing toys. 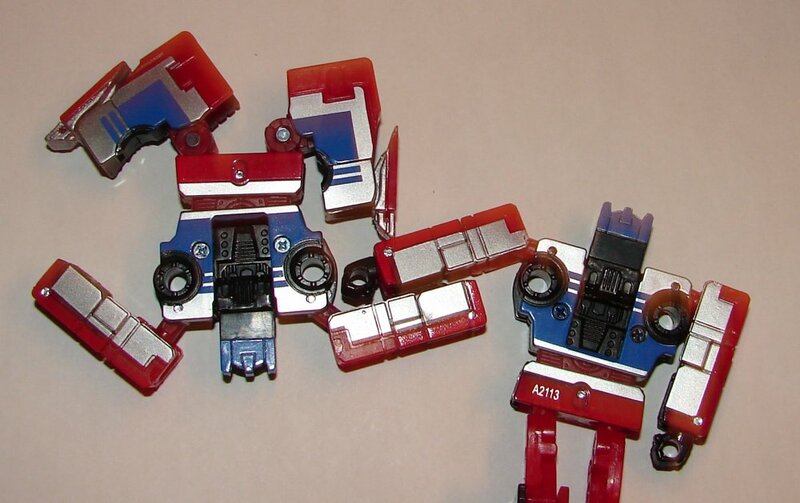 I will go into detail here about the differences between the US and Japanese versions, and as with Optimus Prime, there are a number of them. One thing about the box. It is enormous, much larger than necessary. In fact, he could have been easily packed in a box the same size as the Acid Storm. I get that since they are different prices they didn’t want them to have the same size box, but that is kind of stupid. Lots of extra unneeded packaging. First off, though I didn’t get a picture, the Japanese version has pink cassette boxes and the USA version has clear boxes. I like this change, as I don’t think I’ve ever seen pink boxes for the cassettes before. USA is on the left and the Japanese is on the right in all pics. Soundwave’s eyes are different. 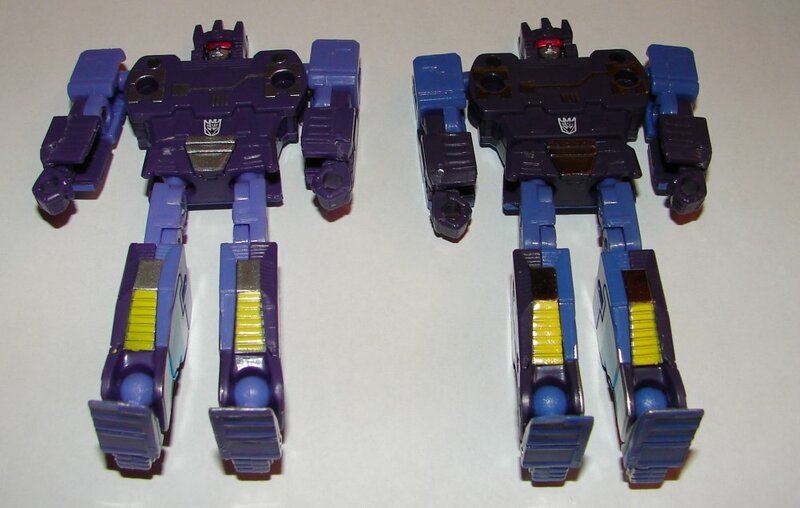 The original Japanese version has red eyes, to match the cartoon, but the USA version has gold eyes to make it more like the G1 toy that had yellow eyes. While I prefer the red, the gold looks really cool, almost like he’s wearing reflective sunglasses. 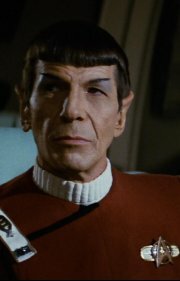 Not a major issue to me, but I can imagine some people being unhappy about this. I caught this one in the promotional photos before I even got the toy. The USA Buzzsaw is a much lighter in color than the Japanese version, more yellow and less orange. I like the darker one, but it’s not that big of a deal. Laserbeak too has lighter colored red paint, but it’s even less an issue here than with Buzzsaw. Frenzy (yes, they got the colors wrong) has a number of differences. Both the dark and light blue plastics are lighter on the USA version. This is a fairly minor thing. What is not so minor is that they did not use silver chrome on the USA version as they did with the Japanese. Instead it just gets silver paint. This seems awfully cheap to me, but then what is Hasbro if not cheap? The rest of the silver paint also appears duller on the USA version. That might have to do with the plastic color beneath and around it, more of an optical illusion, but it looked different to me. 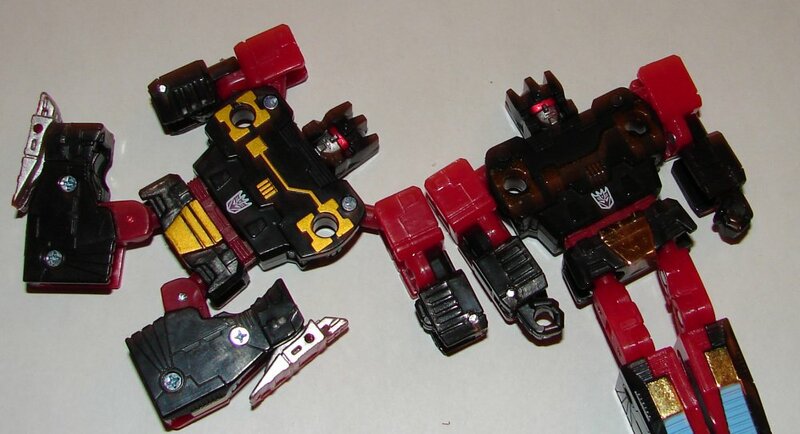 On Rumble, the black plastic is the same, but the red on the USA version is a hair darker. It’s hard to tell in the picture, it’s a very small difference. He has orange-gold paint in place of his gold chrome parts. His silver paint also seems duller. 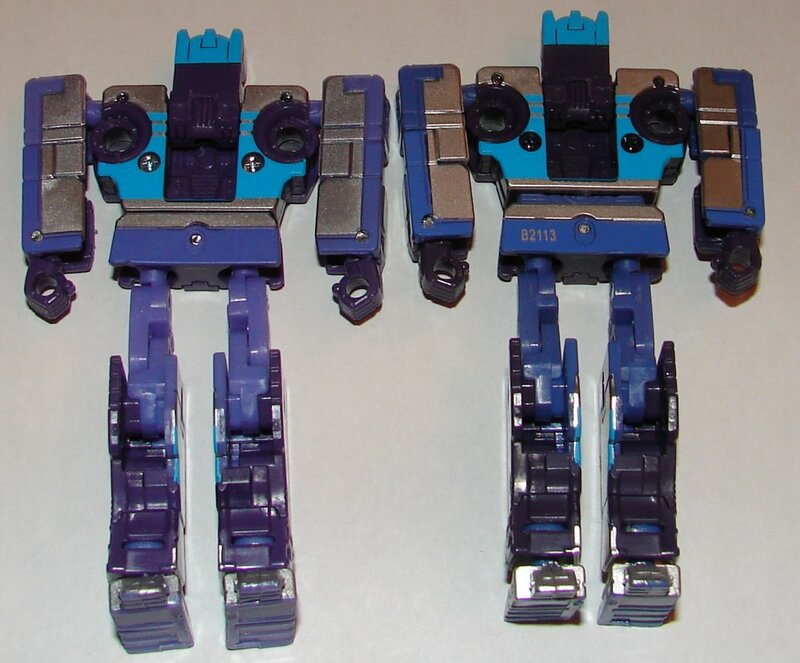 So, only Ravage seems to be identical to the Japanese version. All in all, you can’t complain about the $120 price tag considering how much the Japanese one costs and what an incredible toy it is. This entry was posted in Toy Reviews, Toys, Transformers and tagged Buzzsaw, Frenzy, Laserbeak, Masterpiece, Ravage, Rumble, Soundwave, Toys, Toys R Us, Transformers. Bookmark the permalink.